I own a Quasar comic book. It was 1990 and I was 7. At the time a cover of a comic really sold me and this particular issue got me. I know what you are thinking, and no, I am not gay (not that there's anything wrong with that). 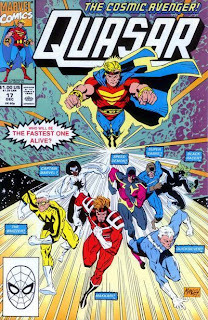 As many older readers may recall, Quasar was quite...well he seemed gay. Gay or a product of the 80's. In Quasar's case: both. (Joking aside, the current incarnation of Quasar is a lesbian. Fun fact!) So what on a Quasar cover would attract a boy? Further proof I'm not gay (not that there's anything wrong with that) is the fact that I love sports. Mostly gymnastics. But seriously folks...I love sports. Baseball, football, basketball, soccer and to be honest, even gymnastics during the Olympics. I like competition. When I was a child my favorite types of athletes were the fast ones. Eric Metcalf and Ricky Henderson were just a couple. This issue fused my worlds. Superheroes were racing. There was a competition and it involved speed. But more importantly...it involved me. Funny side note: the Quasar artist's last name is Manley.